Yancy Baldwin joined the OIL in 2011, although he was on the original Iraq mission with the rest of the OIL members and competed in the DBFA's MGL before that. Since he joined the OIL, his franchise has gone by Reapers. But, with the recent re-brand of Dead Again, it became clear the two franchises were too closely-linked: they shared a common theme (death) and a common color scheme (Raiders-esque silver and black). OIL commissioner Cliburn asked Baldwin if he'd be willing to re-brand his franchise as Roughnecks, and he agreed. Roughnecks makes sense. Baldwin, like so many Oklahomans, makes his living in the oil and gas industry. The commissioner posted an entire article about why, should an NFL team ever move to Oklahoma City, it should be named Roughnecks. In this case, we decided on a color scheme of old gold and black. Oil is black gold, after all. And no one else in the OIL uses that color scheme. The result is a fantastic look that will stand the test of time. 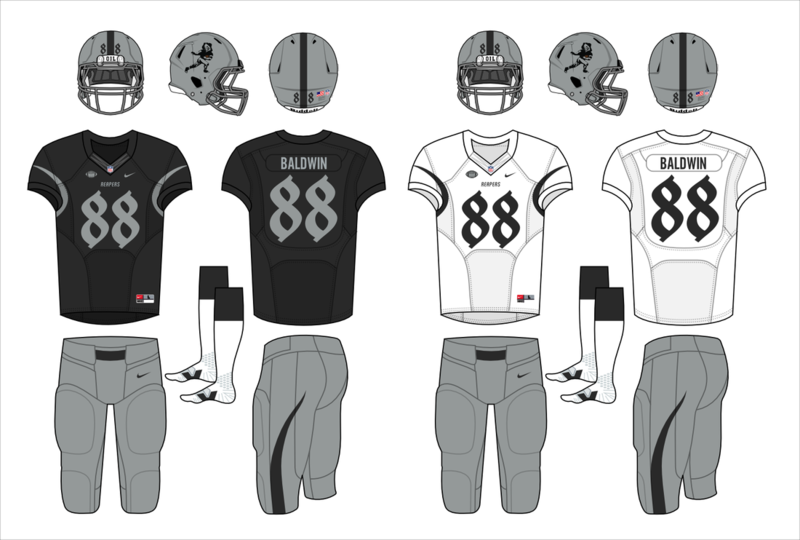 Gone are the silver and black uniforms Baldwin tolerated more than he liked. The new logo is a black oil derrick set against the golden sky at dusk . . . an iconic image in oil country. The shape surrounding the oil derrick symbolizes both the flare of a natural gas well and a drop of crude oil, and below the derrick is another natural gas flare. The primary helmet is black like the night sky. Set against the helmet's dark background, the flame at the base of the logo represents the flares on the Oklahoma horizon that signify, no matter the time of night, roughnecks are working hard to ensure we have energy. The jerseys feature "arms" on the chest to represent the arms of oil rigs that continuously pump oil from the ground of Oklahoma and beyond. The oil derrick logo is proudly displayed on each sleeve, and "ROUGHNECKS" is displayed across the front. The pants striping on each uniform matches its respective helmet. The alternate uniform has "BLACKGOLD" printed inside the collar. It features the black logo on the black helmet with no striping. The numbers are black with gold trim. Primary logo featuring oil drop, oil derrick, and natural gas flare.